Scientists in Singapore have uncovered an immune system defect behind inherited recurrent skin cancer, another breakthrough in understanding the pathways leading to the disease. They found that mutations in the gene, NLRP1, cause the immune system in the patients' skin to misfire, dramatically increasing the risk of developing skin cancer. The mutations make the NLRP1 protein hyperactive and prone to abnormal activation, leading to a detrimental, misdirected immune response in the skin. The gene was not previously known to cause human disease, and its discovery provides an attractive drug target to treat chronic skin inflammatory conditions that are also related to the immune system, such as eczema and psoriasis, as well as aggressive skin cancer that is resistant to surgery, the team said. The finding by Agency for Science Technology and Research (A*Star) researchers was published in the scientific journal, Cell, in September. "This is a significant illustration of how studying rare diseases can benefit the research on common ailments afflicting the general population," said Dr Bruno Reversade of A*Star's Institute of Medical Biology who led the study. This is a significant illustration of how studying rare diseases can benefit the research on common ailments afflicting the general population. DR BRUNO REVERSADE, who led the study, on how the discovery could help in treating chronic skin inflammatory conditions that are also related to the immune system. Dr Tan Wee Ping, consultant and head of the Skin Cancer Clinic at the National Skin Centre, said skin cancer research has progressed significantly on all fronts over the last decade, translating into better surgical, medical and topical treatment and care. 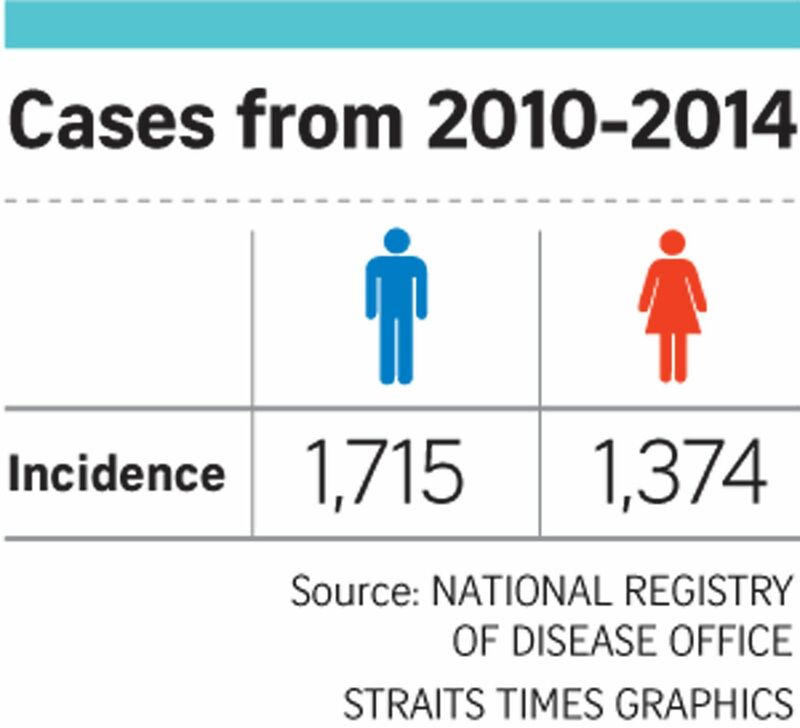 Skin cancer is the sixth most common cancer in men in Singapore, and the seventh most common in women. Between 2010 and 2014, it afflicted 3,100 people here. It is, however, considered to be less deadly than other cancers here. The most common form of skin cancer here is basal cell carcinoma (BCC), a slow-growing non-melanoma skin cancer that damages skin tissue and causes scarring, but rarely spreads to other sites. It usually appears as a pearly or waxy bump, or a flat, flesh-coloured or brown scar-like lesion on sun-exposed areas of the body. "Fortunately in Singapore, most patients come to us early enough for surgical management of their BCC and surgery offers the best chance of cure in suitable patients," said Dr Tan. The second most common type of skin cancer is squamous cell carcinoma, also a non-melanoma skin cancer, which is considered more dangerous as it can metastasise. Melanoma, the most serious and aggressive form of skin cancer, is fortunately much less common in Asians than Caucasians because of their darker skin, which has more melanin and natural protection against the sun's UV rays. Advances in treatment for skin cancer include drugs which block specific proteins in pathways that cause skin cancer to develop, as well as topical medications. Topical medication allows superficial skin cancers to be treated effectively without surgical treatment, said Dr Tan. One example is 5-fluorouracil, which is applied directly on the skin to kill tumour cells on or near the skin surface. As it does not spread throughout the body, it does not have the same side effects as systemic chemotherapy. Another promising area of research into skin cancer is immunotherapy, which primes the immune system to recognise cancer cells and destroy them. •For enquiries regarding skin cancer, call the National Skin Centre on 6253-4455. You can also contact the National Cancer Centre Singapore on 6225-5655 or e-mail it at cancerhelpline@nccs.com.sg.